Roku, creators of the popular Roku streaming media box, today announced Roku TV, a new line of smart televisions with Roku software already built in. To create the new line, Roku has partnered with major Chinese TV manufacturers TCL and Hisense to provide the hardware. The user interface is all Roku TV, however, bringing the familiar look of Roku and the Roku Channel Store to your living room without the need of a set-top box. Now, obviously, smart televisions are nothing new. What’s new and cool here is that Roku TV embraces a user interface superior to many existing smart TVs. It’s not uncommon to see smart TV owners hook an Apple TV, Chromecast or Roku box up simply for the more elegant, user-friendly experience. For fans of the Roku interface, the new Roku TV means one fewer box cluttering an oft-crowded living room entertainment center. 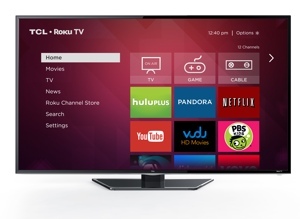 Roku TV will be available in sizes ranging from 32 to 55 inches in the U.S. this fall. Pricing has yet to be announced.